If you have an outdoor living space, a great way to decorate it is by using outdoor rugs. Outdoor rugs are designed to survive in any weather condition and prevent the growth of mold and mildew. However, it is still important to take proper care of your outdoor rug. 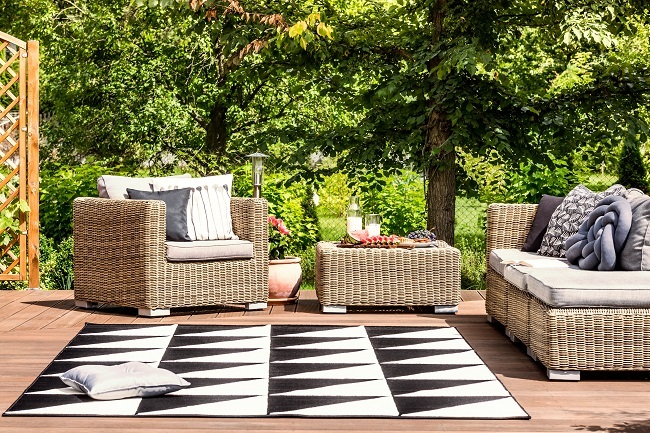 Here are some tips for keeping your outdoor rugs clean. Vacuum your rug to remove any soil that got stuck in it. This will help prevent the growth of mold. Most outdoor rugs are made of synthetic material to prevent mold from growing. However, moisture gets trapped in the soil, and mold and mildew often follow. Clean your rug from any dirt, debris, or food that may have gotten stuck on it. You can gently wash it off by rinsing both sides with a hose. You can also use a mild detergent or soap mixed with warm water and a gentle brush. When your rug gets stained with food, drink or pet waste, remove any solid material or excess liquid with a cloth. If necessary, use a soft brush. Then, use a soft cloth to blot out the stain. If it is a heavy stain, such as wine or tomato sauce, blot it out with a white cloth and use a mild soap or baking soda if needed. Avoid rubbing it, as that will just spread the stain further. When not using your rug, roll it up and put it away. Store it in a cool and dry place so that it stays clean. Don’t leave it outside, and make sure to keep it away from moisture. Need help with creating and designing your outdoor living area? Outdoor living areas are a great way to enjoy the comforts of your home and the weather at the same time. Contact us today for professional help.